I’m so excited to share these hand picked eco-friendly and well designed goodies from my holiday wish list! I’ve selected mostly experiential gifts–creative things that your friends and family can do with their own hands. 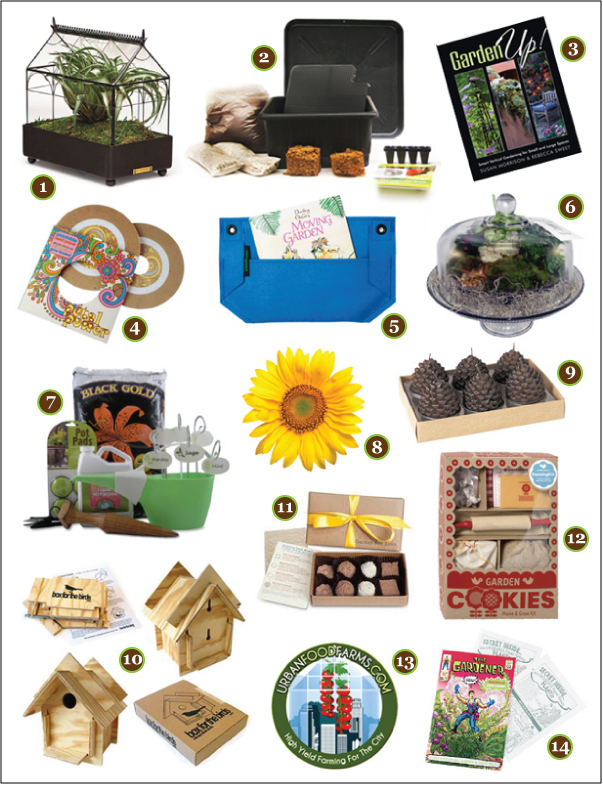 How about some awesome gardening kits and a DIY bird house that both adults and kids can build and enjoy together? Or some plantable cookies and garden bon bons. For indoors, take a look at some classic and offbeat terrariums. And how much fun are plantable paper records and comic books? For a gift that keeps arriving all year, consider giving someone membership to aseed of the month club. Inspired by the design of English conservatories, this small glass tabletop terrarium has a dark gray powder coat finish metal tray and a plastic liner. Photo: Ralph Anderson for Southern Living. Endless organic vegetables using the Square Foot Gardening method, all natural soil amendments, and a self-watering reservoir design. Simply mix in the soil amendments, plant your vegetables, and wait until the roots are long enough to dip into the reservoir. No worries about over or under watering. Made in the US with recycled plastic and available in Black or Terracotta. Loads of gorgeous photos and do-it-yourself ideas that not only inspire, but can work in your own spaces. You don’t have to be a rock star to grow a garden. Record sleeve has 2 sheets of plantable paper filled with ready to sow wildflower seeds. Mini Wally vertical pocket garden comes with children’s book to inspire parent-child gardening and encourage kids to have fun with plants while learning about gardening. When my friend Kylee Baumle of Our Little Acre turned me on to this, I had to have one. Includes everything you need, including step-by-step instructions and your choice of three plants. Looks great in my kitchen! On a balcony, small patio or front door step, this kit contains all the hand-picked tools and accessories to help you start your container garden in style. Non-GMO, open pollinated heirloom varieties. 8 packs of seeds for first month, then 4 packs every month thereafter. As the flame begins to melt the candles, watch the pine cone’s layers begin to unfurl. Created by designer Michael Oliveri and his wife Laura Hoffman as a project to do with their six-year-old daughter, this kit contains a stack of pre-cut plywood segments that easily slide into place without nails or glue. Put it together, then decorate it however you like. Birdhouse has two holes on the back for easy vertical mounting. Seed balls rolled in red clay are shaped like truffles, ripe for the planting. Simply plant them in pots or in the ground for bushels of edible herbs. This fun kit comes with everything you need to form real, flowering cookies for your garden including recipe card with instructions, Flower shaped cookie cutters, Rolling mat, Miniature rolling pin, Reseeding flower seeds, Organic clay, and Organic soil mixture. Available in Hummingbird/Butterfly and Wildflower varieties. Purchase supports people with disabilities who are employed to manufacture and package the product. Hydroponic rack kit for limited space indoors or out, great on a balcony. Comes with 4 trays and can carry a maximum of 8. Install on any surface: wood, tile, sand, dirt, concrete, asphalt. Totally free-standing, does not need to be anchored and installs easily without tools in about 20 minutes. Inside this superhero adventures comic book jacket are two amazing sheets of ready to sow plantable paper filled with herb seeds. Packed in a clear plastic sleeve with simple planting instructions on the back.